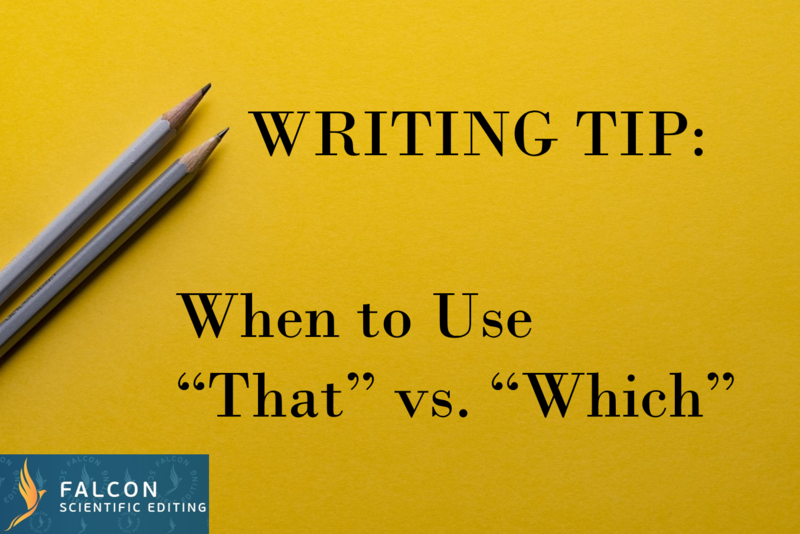 Deciding on whether to use “which” or “that” is something many writers and researchers struggle with, and our customers often ask for writing tips on this topic. While there may not seem to be much difference between these two little words, they have different uses, and this is grammar topic that has specific rules that you should be aware of when proofreading your own scientific article. Grammatically, “that” is usually used with a restrictive clause, and “which” is usually used with a non-restrictive clause. Simply put, this means that the phrase following “that” needs to more specifically identify something, whereas the phrase following “which” elaborates on something and can be easily taken out without affecting the meaning. In most cases, commas are used to set off “which” clauses but not “that” clauses. Both "that" and "which" are relative pronouns but they are used in different ways. The subject said that she was feeling tired. The reviewers recommended that the experiment be replicated. In the above example, the writers are giving more information about this procedure, not restricting the type of procedure. In informal speech and writing, “that” is sometimes used when “which” and “who” should be used; however, in formal written English, the above rules should be followed. Informal: The archeologist that made the discovery was on the news last night. Formal: The archeologist who made that discovery was on the news last night. We hope these writing tips about the differences and when to use “that” vs. “which” in your scientific article have been helpful. Do you have specific questions about a sentence in your paper? Do you have other questions about relative pronouns? Message us today and ask for free! Complete our Blog Feedback Survey and Receive 10% Off Your Next Order! 1. Anderson, M. “Among High School Seniors, Interest in Science Varies by Race, Ethnicity.” FactTank: News in the Numbers. Pew Research Center. 4 Jan. 2017. Accessed 28 Feb 2017. 2. Luan, L., et al. “Ultraflexible Nanoelectronic Probes Form Reliable, Glial Scar-free Neural Integration.” Science. AAAS. 17 Feb 2017. Accessed 28 Feb 2017. 3. Niidome, T and L. Huang. “Gene Therapy Progress and Prospects: Nonviral Vectors.” Abstract. Gene Therapy 9.24 (Dec 2002): 1647-52. ProQuest. Accessed 28 Feb. 2017. 1. Keck, R. and Angeli, E. “Introduction and General Usage in Defining Clauses.” Purdue Online Writing Lab. Purdue University. 13 Feb. 2013. Accessed 28 Feb 2017. 2. Toews, Myron L. “The Grammar Hammer: Common Mistakes in Scientific Writing.” PowerPoint. October 2012. Creighton University School of Medicine. Dr. Alyssa Colton has a Ph.D. in English from the University at Albany, State University of New York (SUNY). She has taught and worked with students of all levels and backgrounds on writing skills for 20 years. She is a freelance writer and editor specializing in science, health, productivity and career development.